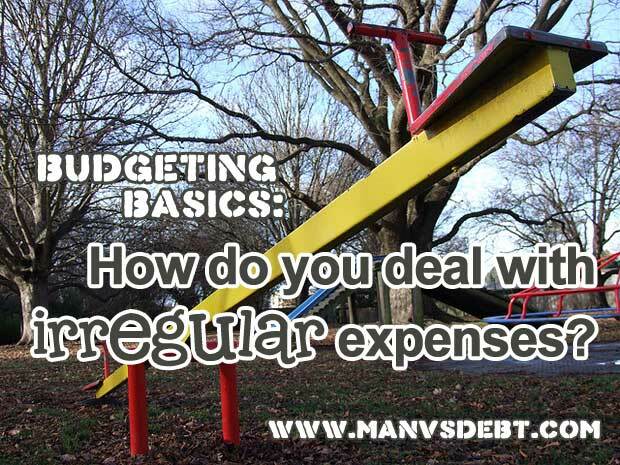 Budgeting Basics: How Do You Plan For Irregular Expenses? Note: This is a post from Joan Concilio, Man Vs. Debt community manager. Read more about Joan. To kick of the year, last month I shared two “Budgeting Basics” posts about one of the most important topics in personal finance – the emergency fund. This month, I’d like to address an issue that confused a lot of people in those posts: IRREGULAR EXPENSES. Specifically, what’s the difference between an irregular expense and an “emergency,” and how do you deal with things that aren’t exactly every-month bills but don’t fit the definition I laid out for an emergency, either? That’s where the irregular fund comes in (and hopefully this will sound familiar to those who’ve been through our You Vs. Debt course). My plan today is to give a basic explanation that deals with a lot of “what if” expense cases, and then next month, we can start talking about basic budgeting in earnest! What is an irregular expense? I might have caused some confusion when talking about emergency expenses, because I put them in frequently-occurring categories like medical and home and car. Those are all areas that have emergencies – but they’re ALSO all areas that have irregular expenses, and that can get confusing! Breaking my wrist is a medical emergency. I didn’t plan to do it, and it will have costs that I could not have budgeted for specifically. Filling my prescriptions is an irregular medical expense. It doesn’t necessarily coincide with a monthly “bill,” as I often use 90-day supplies, and the exact medications I take vary at times; however, in general, there is a dollar amount I can expect to spend every few months on this cost. In the case of a fracture, I’d likely need to tap into my emergency fund to cover unexpected emergency-room costs. In the case of my prescriptions, I’m going to kill my emergency fund pretty quickly if I dip into it each time I need to fill those pills! An irregular expense doesn’t occur on a strict monthly schedule, but it can be anticipated. Another good example I used in an email exchange with a reader this week is my trash and sewer bill, which is paid quarterly at about $150. I just paid it, and that means I need to set $50 set aside for each of the next three months so that I can pay the NEXT one without trouble. When we get into actually “budgeting” for our monthly expenses, it’ll be key to have a list of irregular expenses in addition to the regular monthly bills, so let’s get a jump on that this month! Essentially, this list should include any expenses that you can be pretty certain will come up in the coming year, but that aren’t bills that occur each month. Step 2 is to set a rough dollar amount for each of those expenses. Don’t get bogged down in looking for your last exterminator bill. Just ballpark it, estimating high if you need to guess. Step 3, once you have your list of irregulars, divide them into a handful of loose categories. You get the idea. In essence, you want to have “buckets” that you’re filling (and drawing from) that are big enough to account for the variety of things you need irregularly, without driving yourself crazy with an item-by-item accounting every month. Step 4 is to total each of those loose buckets or categories and come up with an ANNUAL dollar amount you’ll need. So if you pay an exterminator $100 quarterly, you know you’ll need to add $400 to your “housing” fund just to cover that. If you also pay quarterly trash bills of $150, then you need to up your “housing” fund to $1,000 annually to cover both expenses. How do you fund your irregular fund? Step 5 in irregular-fund planning is to divide your TOTAL in each category by 10, and plan to set aside that amount each month. Why divide by 10?? This is one of the most awesome tricks I learned from Baker in You Vs. Debt, and I’m a big fan. Essentially, this is your buffer. You might need $1,000 a year in a certain categroy, which is about $83 a month. But what happens when you’re in month two and you need $200? Obviously, if you could set aside the whole $1,000 up front, that’s stellar. Most of us can’t – and that’s where a divide-by-10 strategy helps us build up a buffer fairly quickly without being a huge dent in the wallet! So how do you set aside whatever a tenth of your irregular expenses works out to each month? For most of us, that’s going to be a FAIRLY LARGE dollar figure (probably even with one of your larger bills, such as heating). In my case, I originally treated my irregular fund like a monthly bill; a payment to that fund was just like the payment to my phone company on my standard budget. THAT WAS HARD. When we started that system, we’d just created a $1,500 emergency fund, and that required major scrimping. So we scrimped a little more, and sold some more crap, until we were able to get a couple of months of irregular expenses covered. The good news is, once you start doing this, you’ll soon realize that you don’t SPEND this money all at once. So, while you do need to fund it steadily, lest you get caught short, you also have the flexibility to add an extra $50 one month and go light $50 the following. In our case, we handle our irregular fund as a buffer in our regular checking account. Since these irregular expenses are, essentially, bills that come up, we want that money easy to access. Doing this has given us, over some time, a clear idea of how much is required. For us to cover all of our irregular expenses, if we have $1,200 in the checking account the day before we’re paid, we KNOW we’re good. What I’ve learned is that the most I’ve ever needed to expend from my irregular fund in a short window is $1,200. That means that I need to have that much on hand, or, like my emergency fund, if I dip below that, I need to focus on a couple rebuilding months to get it back to that amount. And during that time, I treat it like a bill – I write the amount on my bill-paying calendar and I work hard to get back to the $1,200 minimum as quickly as possible! This takes time to develop. At first, I highly recommend taking your best prediction of your annual amount, dividing it by 10, and simply sticking to a contribution of that amount each month. Just don’t be afraid to re-evaluate as you go! Next month, we’ll start digging into the month-to-month budgeting stuff in earnest – monthly income, and monthly expenses. For now, I’d love to know what questions you have about irregular expenses in general, and how you’re currently accounting for them. Joan, thanks for explaining this concept. I have something along these lines, just not as sophisticated. Once I closed all credit lines connected to my checking account, I needed something that was faster to access than my emergency bank for expenses like this. So I now hold several hundred dollars in a savings account linked to my checking at the same bank. It helps me sleep better having a main emergency fund and an irregular fund that I can access instantaneously. Also adding a $50 buffer line to my budget lets me pay aggressive amounts on debt without worrying about bouncing my account all the time. I do have many irregular expenses. As much as I want to budget, there will be things that needed prompt financial attention. Often times I noticed, that as much as I wanted to save, challenges and temptations to buy sets in. It’s definitely different for everyone but I like to set aside a monthly budget for irregular expenses of say $25.00/month and have it rollover if not used for that month. We just move any left over money if there is any to our meager emergency fund and pay for irregular expenses. Which probably is why alot of the times, our emergency fund doesn’t grow but shrink drastically at times. We put any spare funds in our mortgage offset account and then any irregular spending we can’t pay out of our monthly income we will pay out of the offset account. Great article! Thanks for sharing. This is a very important topic, because irregular expenses can easily make people feel defeated when they are first starting a budget. I always recommend keeping a buffer in your checking account for such an expense. We can anticipate the unanticipated events. They will happen for sure and it’s not always an emergency. Good tips. I use an electronic bookkeeping program and enter my “buffer” amount as in expense to an account I call Checking Holding. I date that entry Jan 1, and change the year every new year to the current year. Of course the money is still in the checking account. To me, it just makes it that much more motivating when my books tell me I’m running a negative checking balance and by buffer is below the target. I do the same with my savings, creating a savings holding for my yearly property taxes because although it is savings, it’s gone when November’s property tax bill arrives and so I don’t consider it true savings (if that makes sense).